There are many kinds of ornamental glass such as crackle glass, pressed glass, carnival glass, and many more. I don't much about these types, but there are some excellent links below. Christmas Lights (also called Vigil Lights, Fairy Lights, or Illumination Lamps), were made around 1750-1850. 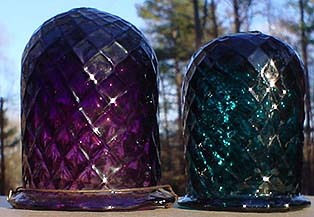 A pontilled amethyst example (believed to be Stiegel) is shown above on this page, along with a pontilled teal example. Christmas lights were ornamental glass, usually made with a cross-hatch design, and held a candle inside (many still have wax remains inside). The lights were typically strung in a row along the driveways of wealthy people in Victorian England. The lights were lit every night, usually by the gardener boy using a taper. They were also hung along the sides of boats and buildings. While some believe these were hung from Christmas trees (and maybe a few were), this practice would have been dangerous. For questions on Christmas Lights, contact Rick and Berny Baldwin at rsbaldwin@worldnet.att.net. OnLine Glass Museum is an excellent site by Angela Bowey.